As Singapore’s lead industrial infrastructure developer, JTC spearheads the whole value chain of industrial infrastructure development. From planning, design, construction to maintenance, JTC’s breadth of capabilities enables its scholars to be involved in the multifarious aspects of industrial infrastructure development. On top of that, JTC’s emphasis on innovation allows scholars to have the opportunity to pioneer cutting-edge space solutions to support and catalyse the growth of industries and enterprises. These factors formed the driving force for Ng Li Hui to take up the JTC Full-Term Scholarship. Coupled with her interest in business and industry development, the Geography major had found herself right at home at JTC. The JTC scholarship provided Li Hui with a springboard to study in the UK. She pursued a bachelor’s degree in geography at the University of Oxford, as well as a master’s degree in international planning from the Bartlett School of Planning at University College London. As part of the JTC scholarship, Li Hui’s development was also given a boost with two internship stints at JTC’s Land Planning Division. The first internship took place before she entered university while the second was during her undergraduate studies. Some of the projects she worked on then included the study of green buffer fulfilment at Changi Business Park, plot ratio policy, and research on logistics systems. In fact, she is currently working on long-term projects that she was first exposed to as an intern! Today, Li Hui is fulfilling her role as Assistant Manager within the Land Resource Management Department. The department manages the industrial land bank – more specifically, it recovers land from and allocates land to companies. Li Hui also handles estate operations and plans for the redevelopment of estates. 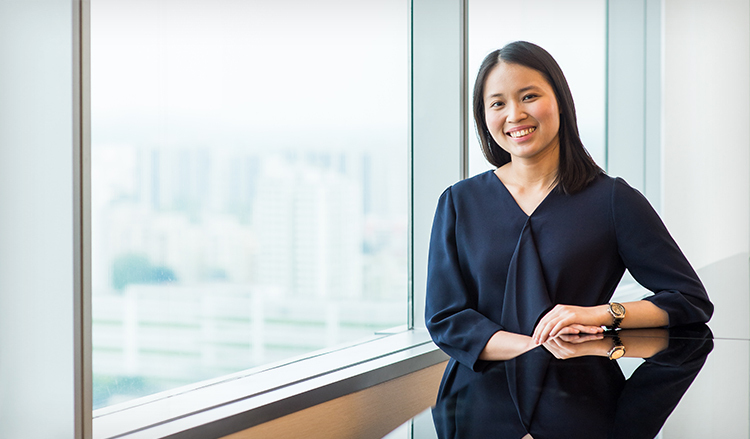 Her multifaceted job scope ranges from planning the road network for a 70-hectare estate to assessing the solution to be taken when someone encroaches on one of JTC lessee’s land. In addition, she has undertaken the responsibility of master-planning and partakes in studies for land use innovation. “As land resource is scarce in Singapore, there are always multiple stakeholders invested in determining how a piece of land is used. What is most fulfilling about managing land resource is coming up with an optimal solution to suit various interests in a complex case, overcoming constraints of the land, satisfying stakeholders, and maximising land use,” says Li Hui. Li Hui also recounts her efforts in resolving the land issues for a new JTC development. She tells us, “The development had long been conceptualised to be located at a site in my estate. However, following the site investigation, we discovered underground constraints that rendered the site unsuitable. We first studied whether it was possible to divert these underground structures, but realised we couldn’t reconcile the timeline of the underground infrastructure diversion with the business urgency to build this development. After amending the planned road network, we managed to shift the site to avoid the underground constraints, only to find an air-based constraint imposed on the proposed development. We were finally able to resolve this by flipping the layout of the development. It was a very memorable experience because the time pressure made the whole process very intense”. With such diverse challenges, Li Hui hopes to accumulate experience that she can leverage to make a better assessment of land issues that arise. Li Hui rounds off inspiringly, “My challenges have taught me that nothing is too difficult for us at JTC if we put our minds to it and work together! Find out how ST Engineering is poised to harness engineering opportunities and meet the challenges of tomorrow.